NEW ORLEANS – The U.S. Track & Field and Cross Country Coaches Association (USTFCCCA) has announced the list of student-athletes who earned USTFCCCA All-America honors for the 2014 indoor season based on their performance at this past weekend’s NCAA Division I Indoor Track & Field Championships in Albuquerque, N.M.
First-team honors were given to those who placed in the championships’ top eight in an event or were a member of an eight-person final. Second team honors were earned by those who finished between ninth and 16th place. In addition, 14 men and four women earned honorable mention honors. 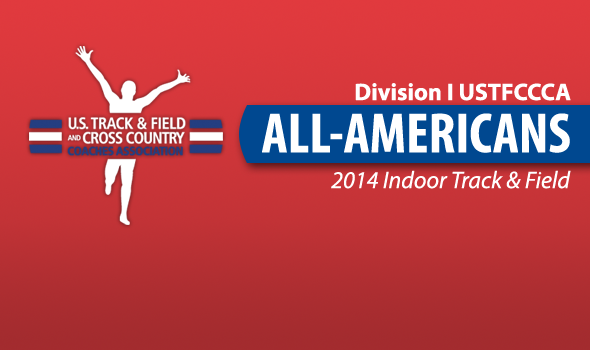 USTFCCCA membership by a program is required to earn All-America awards. National women’s champion Oregon needed each and every one of their 14 first-team All-America performances to overcome Texas in the national team championship race for their fifth consecutive team title. That ties Oregon for the longest women’s title streak indoors with LSU from 1993-97. With a lean by Phillis Francis at the line in the meet’s closing 4×400 relay, the Ducks defeated the Longhorns both in the race by .02 seconds and in the team scoring by half of a point, 44-43½. Also tied within 3½ points of the team title were Florida and its nation-best 16 first-team All-America honors and Georgia with six. Though 30 women earned multiple first-team honors, including double champion Abbey D’Agostino of Dartmouth at 3000 and 5000 meters, perhaps the most valuable trio of multiple-honorees were the Ducks’ Francis, Laura Roesler and Chizoba Okodogbe, who ran three of the four legs on Oregon’s American and collegiate indoor record 4×400 relay. Both of Francis’ honors came in American- and collegiate-record fashion with a title at 400 meters individually before chasing down two-time defending outdoor 400 meters national champion Ashley Spencer of Texas to win the 4×400 and team title at literally the last second. Florida had five individuals earn two first-team honors, while both Oregon and Arkansas had four each. Texas had three multiple honorees, while Dartmouth, Penn State and Texas A&M each had two. Men’s team champion Oregon led the way with 16 first-team honors, followed closely by Arkansas – the defending champion over which the Ducks claimed the team title – with 15. The Ducks defeated the runner-up Razorbacks in the team competition, 62-54. The title was the first for Oregon since 2009. Providing nearly a third of Oregon’s points with wins at both 3000 and 5000 meters – including dethroning defending champion Lawi Lalang of Arizona in the latter – was frosh sensation Edward Cheserek. With those two wins translating into All-America honors, he was one of four Ducks to earn two first-team All-America honors along with Mike Berry, Marcus Chambers and Trevor Dunbar, and one of 18 overall student-athletes earning multiple honors. Arkansas with three multiple-honorees and both Notre Dame and Pittsburg with two were the only other men’s programs with student-athletes who earned more than one first-team All-America honor. More good news for Notre Dame as the Fighting Irish’s Patrick Feeney was the lone athlete in the meet, male or female, with three first-team nods: 400 meters and the 4×400 and distance medley relays. Overall, the SEC led the way in total first-team honorees both in the men’s (39) and women’s (65) competitions, with the Pac-12 both second in both with 38 and 31 respectively.